Vertebral artery dissecting aneurysms presenting with hemorrhage carry a poor outcome if left untreated, with an early repeat hemorrhage in 70% of cases and a high mortality of 46.7% in those patients with a repeat rupture. Therefore, an early treatment is required to prevent a repeat rupture. In this issue, Chinchure et al., have described their experience of treating ruptured vertebral artery dissecting aneurysms by both deconstructive and reconstructive techniques. The authors favored the technique of trapping of the parent vessel in patients with a contralateral dominant/co-dominant vertebral artery. Though an effective technique, the possible challenges with this technique are that of migration of coil, under-packing, symptomatic infarction and rebleed. Symptomatic infarction in the territory of the occluded artery that is directly related to the procedure has been reported to occur in approximately 5.3% of patients with endovascular trapping, with a repeat hemorrhage rate of 3.1%. However, in our experience, in appropriately selected patients, trapping appears to be a safe and effective technique and we have not encountered any incidence of symptomatic infarction or re-bleeding in our patient group. The authors of the paper tended to use oversized coil in order to prevent distal migration. However, oversizing of the coils in a ruptured dissecting aneurysm may perhaps increase the risk of rupture during the procedure. Therefore, one of the options that can be considered under such circumstances is to use dual microcatheters to avoid distal coil migration and, in addition, achieve better packing and occlusion [Figure 1]. In our practice, to avoid distal embolism, we maintain adequate heparinization during the procedure. In addition, following coil occlusion, we administer heparin for a short period, approximately 48 hours, and follow it up with administration of aspirin alone for 6-weeks. To avoid an episode of rebleeding, we advocate trapping of the segment of the vessel that is involved with the dissection and also occlude a very short segment of the proximal normal parent artery. The two factors that would dissuade the doctor from trapping the parent vessel are:First, if the contra-lateral vertebral artery is hypoplastic; and, second, if any critical artery such as the posterior inferior cerebellar artery (PICA), anterior spinal artery or medullary perforators arise from or are in close proximity to the dissected segment. Symptomatic infarction has been noted in about 38% of the patients if trapping is performed in patients in whom the PICA arises from the dissected segment; however, others have reported a good outcome even in this group of patients and have attributed it to good pial collaterals. The authors of the paper have performed proximal occlusion in one patient in whom the PICA arose from the dissected segment. However, this approach is not without drawbacks, the key disadvantage being the possibility of a repeat bleed that has been reported to occur in about 19% of patients. Reconstructive techniques are better suited for the aforementioned patient category. Furthermore, endoluminal reconstruction appears to be the most appropriate strategy in unruptured aneurysms, particularly due to the low risk of acute bleeding. According to a meta-analysis, although sac occlusion was better with trapping, the perioperative morbidity and mortality, recurrence and retreatment rates, and long-term clinical outcome were similar with both the deconstructive and reconstructive techniques. Single stent with coils, overlapping stents, and flow diversion are the reconstructive techniques that have been described in literature. Stent-assisted coiling is an effective method to treat such aneurysms; however, it is at times technically challenging, and we advocate using multiple small coils to pack the sac in order to avoid an extraneous outward pressure that can result in aneurysmal wall rupture. In our experience and according to previous reports, stent assisted coiling appears to be less effective than trapping in achieving a long-term aneurysmal occlusion in dissecting fusiform aneurysms and some of these patients need further treatment after the primary procedure. The authors have used a single stent with coils and have not documented recurrence rates on a long-term follow up. Therefore, one may wish to use a stent within a stent. Overlapped sents, by introducing better flow diversion, promote thrombosis and enhances sac occlusion [Figure 2]. The stent type utilized in the procedure may play an important role in the effectiveness of the procedure and is discussed further. Flow diversion appears promising as there is growing evidence that side branch occlusion is less of a concern. Outcomes appear favorable with this technique, with the peri-procedural ischemic complication rate and the retreatment rate being 8.3% and 2%, respectively. Two principles are to be followed in actual practice that allow for a lower periprocedural morbidity:First, a single device that is apposed to the wall serves better than multiple overlapping devices to avoid the endovascular leak and achieve a better long term occlusion rate; and second, the shortest device that ensures adequate coverage in order to avoid side branch occlusion as well as thromboembolism is recommended. Another technical aspect of note is to avoid overlapping the entry site of the contralateral vertebral artery, whereever possible, while deploying a flow diverter device [Figure 3]. Reconstructive techniques necessitate administration of dual antiplatelet agents. In patients with a ruptured aneurysm, it is important to determine the need for inserting an external ventricular drain prior to loading them with antiplatelet therapy. The antiplatelet loading strategy appears to be varied. The authors have suggested loading with either clopidogrel or prasugrel; however, the dosing and the timing of administration needs further discussion. The effect of clopidogrel (4 to 8 hours) occurs at a later time point as compared to that of prasugrel (2 hours). Therefore, one may have to time the procedure in such a way that the stent delivery is planned at the time when the maximum effect of the drug is likely to occur. The optimal loading dose of clopidogrel appears to be 600 mg and that of prasugrel, 60 mg. In conclusion, both endovascular trapping and reconstructive techniques appear to be good options for treating ruptured vertebral artery dissecting aneurysms. Parent artery occlusion is our preferred technique in patients with ruptured aneurysms, provided the other vertebral aretery is of a good size and the PICA is not arising from the aneurysmal segment. Other options include stent assisted coiling or flow diversion. Flow diverter technology appears promising in dissecting aneurysms particularly with the growing evidence in favor of this technique. Flow diverters can be considered as an option for un-ruptured aneurysms, and in cases in whom parent vessel occlusion is not possible. Madaelil TP, Wallace AN, Chatterjee AN, Zipfel GJ, Dacey RG Jr, Cross DT 3rdet al. Endovascular parent vessel sacrifice in ruptured dissecting vertebral and posterior inferior cerebellar artery aneurysms: Clinical outcomes and review of the literature. J Neurointerv Surg. 2016;8:796-801. Sönmez ö, Brinjikji W, Murad MH, Lanzino G. Deconstructive and reconstructive techniques in treatment of vertebrobasilar dissecting aneurysms: A systematic review and meta-analysis. AJNR Am J Neuroradiol 2015;36:1293-8. Gupta V, Parthasarathy R, Jha AN. 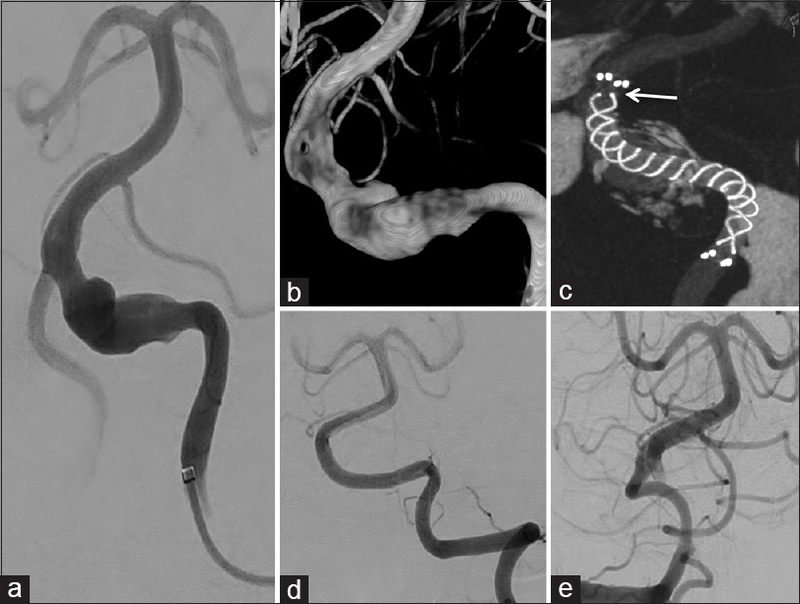 Endovascular reconstruction of aneurysms with a complex geometry. Neurol India 2016; 64 Suppl: S24-31. 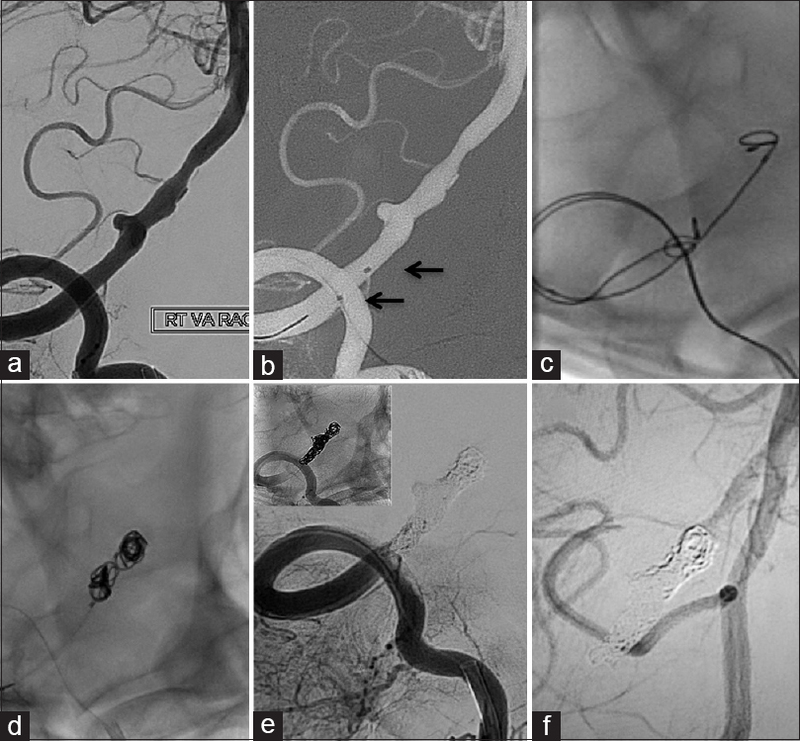 Song Y, Wang Y, Li C, Wang Y, Mu S, Yang X. Retreatment and outcomes of recurrent intracranial vertebral artery dissecting aneurysms after stent assisted coiling: A single center experience. PLoS ONE 2014;9:e113027. Wang C, Tian Z, Liu J, Jing L, Paliwal N, Wang S, et al. Flow diverter effect of LVIS stent on cerebral aneurysm hemodynamics: A comparison with enterprise stents and the pipeline device. J Transl Med 2016;14:199. Wang CC, Fang YB, Zhang P, Zhu X, Hong B, Xu Y, et al. Reconstructive endovascular treatment of vertebral artery dissecting aneurysms with the low-profile visualized intraluminal support (LVIS) device. PLoS One. 2017;12:e0180079. Huang QH, Wu YF, Xu Y, Hong B, Zhang L, Liu JM. Vascular geometry change because of endovascular stent placement for anterior communicating artery aneurysms. AJNR Am J Neuroradiol 2011;32:1721-5. Cerejo R, Bain M, Moore N, Hardman J, Bauer A, Hussain MS, et al. Flow diverter treatment of intracranial vertebral artery dissecting pseudoaneurysms. J Neurointerv Surg 2017;9:1064-8.